The Spa Lift will clear a 38-inch high vertical wall up to 14-inches thick. 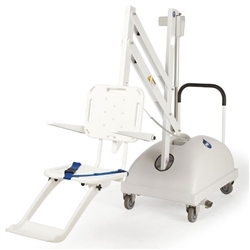 No need to mount into a SPA deck, this lift is completely portable. 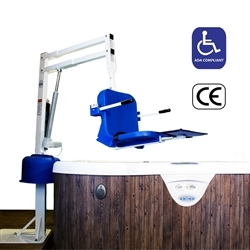 We now offer a wide range of spa lifts to suit individuals with a variety of physical disabilities and handicaps. Whether you have a spa that is outdoors or indoors, these lifts will help you enter and exit the spa with ease. A number of our products are ADA compliant and all of them are built to exceed your expectations where safety and quality are concerned. Call Wheelchair Authority at 1-866-218-0902 today!